We have dealt with Yvonne and The Better Days Rescue Fund extensively over the years. Thanks to them, we have adopted 3 lovely cat family members. Yvonne is a matchmaker straight out of heaven, who also happens to be ethical, efficient, intelligent and highly motivated. When there are literally hundreds of rescue organizations from which one may use to find a cat, why have we returned again and again to Yvonne? Allow us to list the ways in which she distinguishes herself from the pack. Yvonne literally finds that perfect cat for each unique person/ family. She will not place a cat until she understands the unique characteristics / dynamics of the person/ family seeking to adopt. She intimately knows her cats and will suggest the best one truly suited to mesh into the new household. She has always been honest and true to her word. No lying about ages, personalities, behavior or potential health issues [ if any]. 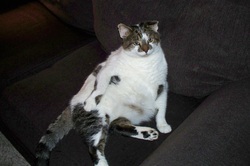 Unlike other organizations who are looking to "unload" cats, Yvonne is determined to make a happy love match. Each year we decided to adopt a new cat, Yvonne meticulously analyzed her fosters. You know it is "right" when after the cat entered our home, we honestly could not dream of life without her. We are rich beyond all measure in love thanks to the 3 precious darlings Yvonne brought into our lives. I first met Charlie in the summer of 2009. I noticed him hanging around in the woods by my house. I would call and talk to him, but he would never let me get too close, and would run away if I approached him. I have a full-length front door and I would often find Charlie sitting there looking in the house. I would try to coax him in, but he would hiss and run away. I started putting food on the front steps,and he would eat it, but was always looking around, and at the slightest noise take off. I knew I was dealing with a feral cat. I made numerous calls, but could find no one to help. As winter approached,I worried about Charlies' fate. My husband went on line and we learned how to make a shelter for Charlie so he could have somewhere to go and escape the cold.Around that time I met Yvonne from the Better Days Rescue Fund. I was telling a friend about Charlie and she gave me Yvonne's number and said she might be able to help me out. Yvonne did more than help, she saved Charlie's life. She came out and trapped Charlie, had him fixed, he got checked out, and got his shots. He was released back at my house, and after much work and patience Charlie is a part of our family. Yvonne's willingness to help me gave me the determination to help Charlie. He still has his wild moments, but when he looks at me with love in his eyes instead of fear, I know I did the right thing. With people like Yvonne and her org. the many homeless cats out there can have a chance to live, and maybe even find love. Simon and I were more than impressed ( totally bowled over, actually), at how you have seemingly built your life around caring for cats... we are certain that your house holds as many felines as you can possibly manage to take in ,and for sure your heart has room for so many more. I love and admire people like you and I wish the world had more ....it would be a less hypocritical and a more gentle place to live I think. Your kitties are happy, healthy, well adjusted, and purrrrrr-fect, a testament to your dedication to what has to be a very demanding (rewarding) and time consuming (fun) occupation. Gotta love it, right? Hats off to you, girl! I am looking forward to a more interesting life (HA!) once the babies arrive, and am taking the "grace" period of the next several weeks to get the kitty room ready for that...You will be a tough act to follow, I'll admit, but we will do our best to make it fun for them. In the summer of 2010, I lost my very elderly calico dear friend. In the Fall I felt it was the right time to adopt two new friends. I started searching the Internet for possible cats to adopt and became very interested in cats that had never had a permanent home. A picture on the Internet of a brother and sister about 2 plus years old caught my attention. 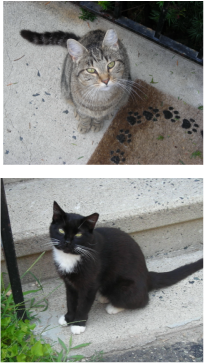 Although they were caught as kittens, they spent most of their lives living with other feral cats. Enter Yvonne and The Better Days Rescue Fund! Yvonne brought them to her home as their foster mom. I went to see them at her home and was impressed with her "family" and how well they were all cared for. I was introduced to Zack and Autumn. Although they wouldn't let me touch them, I was sure that I could give them a good permanent home and that we would become the best of friends. 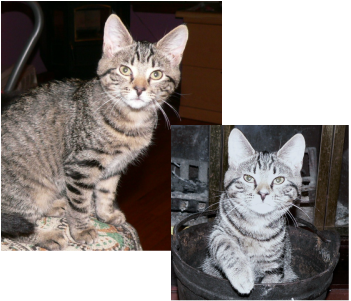 On 1/1/11, Yvonne brought them to my home and stayed for hours in order to help us adjust to each other. She made sure that their paperwork came with them and that all their medical needs were up to date. It took about three months for Zack to let me pet him, but now he's a lap cat! Autumn is a different story, she still won't let me touch her, yet. She's not afraid of me, but she's just not ready to be petted, yet. Yvonne has been fantastic! She has helped me immensely! She has answered the many, many questions I've posed to her throughout this year. She has even offered to help me get them to the vet's. If I am unable to get Autumn there, she will help me. The love and care for her cats is extraordinary! I would recommend her services to anyone in need of a cat of any age!! I assure you, you will not regret it!! As the new year begins, I wanted to write and tell you that the cats are one of our most joyful blessings and I so appreciate them every day! They are doing great and are such great travelers! We have taken them up to Vermont several times and they are fantastic. They are getting quite big and are so loving. They also get along so well with our dog Angus ...It is so funny to see the three of them together! I've attached a photo of them in one of their favorite sleeping spots. I came across a picture of a beautiful litter of kittens in our local paper. One of them looked just like our cat Nanouk who was a part of our family for 17 years. I contacted Yvonne about the kittens and following our initial conversation decided to fill out the adoption application and begin the process. After a long conversation with Yvonne, I realized that the beautiful kitten in the picture was probably not the right cat for our family. We have an 11 year old Boxer and were looking for a mellow, easy-going cat that would enjoy the company of Zeus our dog. Yvonne suggested that we go see one of her kittens fostered by Roberta. That's where we met Clara Belle....but Clara Belle was not the kitten Yvonne had spoken to us about. She was a brave Mama cat who babies had all been adopted (Rafa and Teo above are two of her kittens). As we interacted with two kittens she sat back and observed for awhile and then she came to us. We immediately knew that she was perfect for our family and best of all, Clara Belle had chosen us! It was a pleasure to work with Yvonne and Roberta and adopt our beautiful Clara Belle. When I discovered mice in my house, I knew I needed a cat. A friend told me her friend rescues cats and had some for adoption. The whole experience was wonderful. 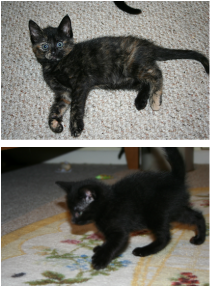 I emailed her my request and she emailed me pictures of the kitties she had available. I picked my little Dowser from that picture and have been totally in love with her from the first. The process was smooth from that first email to Dowser being brought to my house. I received all of her medical records and information on where she was found and how she did in her temporary house. If I was not moving into elderly housing where only one pet is allowed…I’d adopt another one. I tried for over a year to find aid for the burgeoning cat population at my door but was unsuccessful. Then, one summer morning, my husband and I visited an area flea market and saw a beautiful woman at the first table, selling her wares behind a large board of photos of cats. I had found my “official cat rescuer” at last, Yvonne. She and her rescue partner, Roberta, have trapped a great number stray cats and newborns, saving their lives for a good life at many stoops or with adopted families in loving homes.